Download the Registry file InstallTakeOwnership (use the middle mouse button), and save it to a convenient location. Double click the file, and grant administrator privileges if you see a UAC prompt. Then click Yes (to agree to merge the contents of the file). That's it. No reboot is required. Now you will have an option "Take Ownership" in the context menu (right click menu) for certain files and all folders. 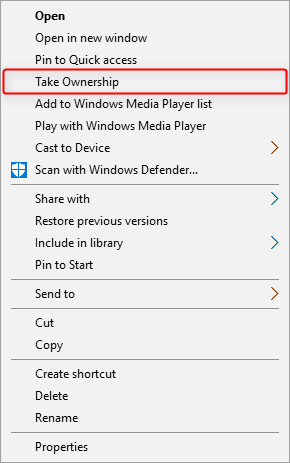 To remove this option from the context menu, repeat the instructions above but use the Registry file RemoveTakeOwnership.